OASE Filtomatic self-cleaning pond filters and filter sets with AquaMax Eco pump. Automatic waste discharge and UV Clarifier. OASE Germany have developed the intelligent FiltoMatic pond filter to greatly reduce the frequency and strain of cleaning. The in-built controller is very simple to use and will automatically purge out the collected pond waste, drastically reducing the need to clean the foams manually. The integrated UV Clarifier will auto-adjust depending on the water temperature, offering power savings up to 40%. The FiltoMatic can be supplied with or without pump and can be used on ponds up to 25,000 Litres. Cleaning a pond filter can be a tiresome chore even with new cleaning advancements. The OASE FiltoMatic greatly reduces the frequency of cleaning and the physical efforts usually involved, making this ideal for elderly pond enthusiasts and pond keepers with little time on their hands. The easy to use digital controller can be set to automatically clean the filter on pre-set cycles or manually purged at the press of a button. All FiltoMatic pond filters include an inbuilt UV Clarifier with temperature sensor, integral sludge pump and also feature specially developed filter foams of coarse and fine grade for sifting and trapping pond debris and flocculated algae. 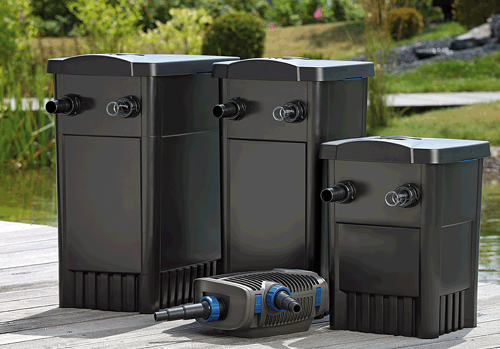 The complete FiltoMatic Sets include the energy efficient AquaMax Eco Premium filter pumps for passing pond waste to the filter. Due to the gravity outlet, we suggest the filter is mounted close to the pond edge to reduce the use of rigid discharge pipe back to the pond. Choosing the correct FiltoMatic CWS for your pond.